Snow plowing is a very basic service during the winter months. Heavy snowfall can make it almost impossible to venture out of your home. Commercial clients are affected too and snow in their parking lots or driveways can deter customers and affect the profitability of the establishment. One of the best ways to avoid all these problems is to work with a reputed and well-established company like ours, for all your snow removal needs. We at Krefta Landscaping Inc provide services to clients in and around Carlisle, Concord, Sudbury, and Wayland. Over the years, we have built a strong customer base in a Belmont, Waltham, Lexington, and Winchester as well. Commercial and residential clients from in and around Lincoln, Andover, North Reading, Westwood, and Wilmington, as well as the surrounding areas, trust us with all their snow removal requirements. As a company that has been operating in this industry for a number of years. We have the experience, skill, technology, and expertise to handle even the most complex snow and ice management jobs for our clients. We cater to residential clients with the same level of commitment and reliability as commercial and industrial ones and can handle snow plowing jobs of all shapes and sizes. Residential Snow Clearing - We ensure that the plowing work is carried out safely and that the landscaping features, outdoor structures, and house aren’t impacted in any way when plowers are being used to clear the snow. 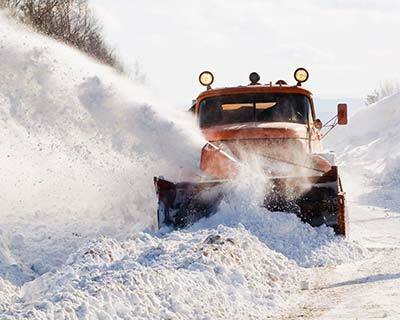 Commercial Snow Removal - Depending on how heavy the snow buildup is, we may use V-plows to create a breakthrough and remove the snow efficiently from commercial spaces such as parking lots, expansive driveways and vast entryways or sidewalks. Industrial Snow Plowing - Industrial properties are often larger than commercial and residential ones and specialized snow pushers, loaders, and backhoe accessories would have to be used in the snow clearing work. In addition to the right equipment, our team is also highly skilled and will quickly and efficiently remove large volumes of snow from your industrial property. Our team will follow weather forecasts during the winter months as this helps us be in a state of preparedness to provide prompt snow plowing services as required. While we never falter on the quality of our services, you will find that we maintain very cost-effective pricing. If you are looking for customized snow plowing services, Krefta Landscaping Inc. is the company to call. You can speak with our experts at 781-249-0012 and tell us what your specific requirements are. Alternatively, send us your requests and queries about snow plowing cost via this Online Form.